For several months now, there has been what one might call a "vibrant" debate over the funding of university research and the potential effect of leaving the EU. This has seen the establishment of a campaigning organisation called Scientists for EU, set up to argue the case for remaining in the EU. However, as the campaign gets more strident, and more overtly political, questions are being asked about this inherently political role of bodies which receive a great deal on public funding. There is good cause for arguing that such bodies should not involve themselves in political campaigns, and especially the EU referendum when the question on the table is "who governs Britain". It is no part of any publicly-funded organisation to intervene in such a debate. 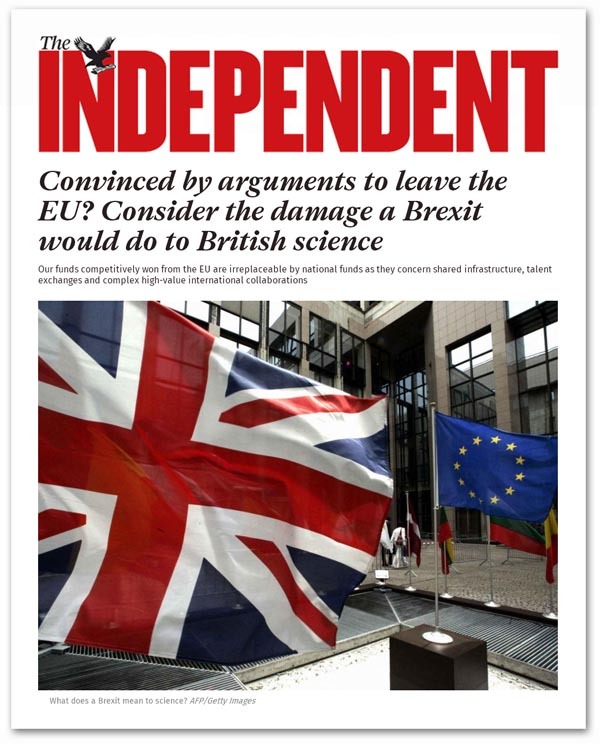 Typical of the propaganda line being adopted comes with the Independent from Christmas Eve, which asks readers to consider the damage which could be done to "British science" by a Brexit. Addressing that issue directly, though, is to take the framing of the Europhile campaign at face value, falling into a huge trap. The campaigners are not actually representing science, per se, but higher education as a whole, which takes some of its funding from the EU. If we then look at higher education as a whole, the perspective changes completely. Firstly, as an "industry", it is huge, earning a massive £30.7 billion in the financial year 2013-14. The Higher Education Statistics Agency lists 666 providers on its register, including approximately 138 universities and some 67 "university sector colleges", operating out of 15,895 buildings. Student numbers (in the year 2013-14) were 2,299,355 comprising 1,533,855 taking first degrees, 226,065 other undergraduates and 539,440 postgraduates. The sector employed 395,780 staff of which 194,245 were academic and 201,535 were non-academic. As to the sources of the industry's £30.7 billion income, £6 billion came from funding body grants (19.8% of income), of which £1.96 billion was allocated to recurrent research. The largest amount, £13.7 billion, came from tuition fees and education contracts (44.5%), other income came to £5.6 billion (18.1%), and endowment and investment income brought in £340 million (1.1%). The actual amount brought in by research grants and contracts amounted to just £5 billion (16.5% of income). Of that, collaborative research involving public funding earned £1.1 billion, contract research brought in £1.2 billion, consultancy contracts	yielded £442 million and continuing professional development (CPD) and continuing education courses brought in £679 million. Of the total of about £7 billion research income, the actual payments from the EU (funded from the UK contribution to the EU budget), amount to a mere £690 million – a tiny fraction of the industry's total income, comprising a mere 2.3 percent. Charities, incidentally, contributed £1.1 billion to UK research in 2012-13. Here, it is worth noting that, compared with the £690 million (of our money) the EU sends to the UK, £3.8 billion comes from fees and accommodation from non-EU students – more than five times the EU research figure. A further £3.4 billion went on goods and services bought off-campus and the total export earnings from non-EU students (2011-12) were estimated at £10.7 billion. In fact, nearly 20 percent of the output generated by the higher education sector can be attributed to the recruitment of non-EU students – accounting for 18 percent of the jobs generated. Yet, for a mere 2.3 percent of the industry's income, we are being told that continued British membership of the EU is essential – so fantastically important that it must over-ride all the constitutional and democratic implications. One might venture that the advocates of this stance have lost their sense of proportion. This has to be a classic case of the tail wagging the dog. And if that was not enough, there is an inherent dishonesty in attributing all this EU funding to "science". The Framework 7 programme (FP7) covered many difference areas, including large tranches of social studies. Then, even those areas which covered scientific issues were not by any means pure science. When I looked at FP7, I found that about 10-15 percent of the funded projects had direct policy relevance. The research was used for setting out parameters for EU intervention and legislation. From its €50 billion budget, I estimated that as much as €20 billion supported the EU legislative programme. When we look at the current Horizon 2020 programme, we can see a similar dynamic. For instance, "actions" for 2014 and 2015 are focusing on, "New ideas, strategies and governance structures for overcoming the crisis in Europe (resilient economic and monetary Union, EU growth agenda, EU social policies, the future of European integration, emerging technologies in the public sector)". The EU is also funding work on "Europe as a global actor", focusing research and innovation cooperation "with third countries, new geopolitical order in the Mediterranean, EU eastern partnership and other third countries". It will also look at: "New forms of innovation in the public sector, open government, business model innovation, social innovation community, ICT for learning and inclusion". In short, the Commission tells us, the Horizon 2020 programme "aims at fostering a greater understanding of Europe, by providing solutions and support inclusive, innovative and reflective European societies with an innovative public sector in a context of unprecedented transformations and growing global interdependencies". In short, the research programme is a gigantic policy generation machine. This aspect of the European Union is rarely understood. Apologists claim that the Commission employs less staff than a local authority such as Birmingham City. But the reason it is able to keep numbers down is by outsourcing much of its policy making. Policy development is being funded through the research programme, with academia co-opted as a fully-fledged partner. And for this and 2.3 percent of its income, the Higher Education "industry" wants us to stay in the EU. The irony is that, should we leave the EU, we can retain participation in the EU's research programme, as does Norway and Iceland - and even Israel. But there is another twist. The EU research cash devoted to policy development is directed at securing "European" solutions, leaving the UK effort depleted. When the UK leaves and starts to rebuild its own policies, it will need the research capabilities of UK universities. For a while, at least, government research spending will have to increase. Higher education can only benefit financially from our withdrawal. If there is a political case, the industry has no business making it.